What do you want in a smartphone? I think I can hazard a guess. You probably want a great screen. Who doesn't, right? Powerful processor? Definitely. How about battery life that doesn't quit? Motorola's Droid Turbo is here to fulfill your wishes. The Droid Turbo is Motorola's latest Verizon-exclusive flagship smartphone. Actually, it's one of three Moto flagships this year: there's the slim 5.2-inch Moto X, the thicker 5.2-inch Droid Turbo, and the giant 6-inch Nexus 6. The Turbo may be the middle child in terms of size, but it's actually got the most impressive specs — including a 565ppi QHD screen and a giant 3900mAh battery. 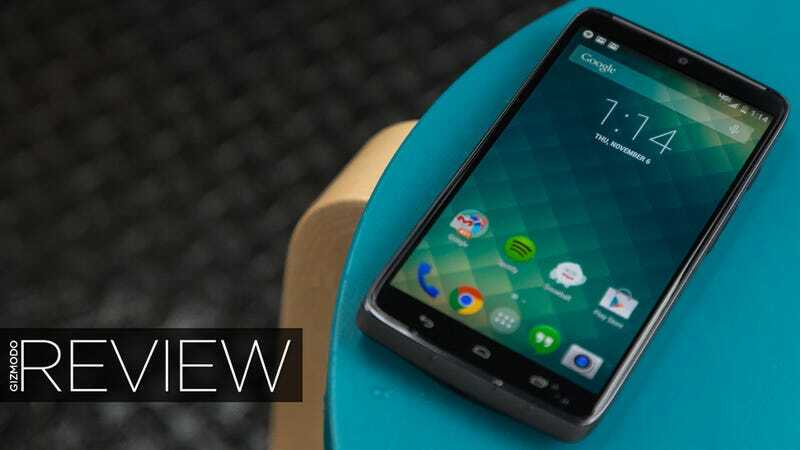 Think of it as the supercharged spiritual successor to last year's Droid Maxx. Though the Droid Turbo isn't cheap, it won't send your wallets and bank accounts quivering in fear: you can nab a 32GB model for $200 and an 64GB variant for $250 (or off contract at $600 and $650), which is actually a small step down from the Droid Maxx's $300 launch price last year. Still, at that price, the Droid Turbo is in direct competition with everything else on the Verizon shelf. That's a lot to choose from, including those colorful Moto Xs and giant Nexus 6s I just mentioned. Great screens, processors, and battery life in an Android smartphone are qualities general reserved for phablets, those finger-stretching monsters that have the room and the weight to pack in a spec-sheet daydream. The Droid Turbo isn't a phablet. Its screen-size comes in at 5.2 inches, just like the Moto X, and its overall footprint is only slightly bigger. It's a scrappy device that thinks it can hang with the big kids, and in many ways the Turbo fits right in. The Droid Turbo comes in two distinct designs. The first one is the familiar fiberglass weave we've seen on many a Droid. But for the last week, I've been toting around a 64GB Droid Turbo covered in ballistic nylon. You wouldn't normally think of nylon as a more intriguing, exotic material than, say, bamboo or leather or fiberglass, but it truly is distinctive... if only because nobody's done it before. Besides, the fiberglass, if you don't know better, just looks and feels like plastic, but the nylon looks great and feels great too. But when it comes to design, your choices aren't just between fiberglass and nylon, but also between the Droid Turbo and the customizable Moto X. Among the Gizmodo staff, it's a pretty polarizing issue. The Droid Turbo is a much bulkier device than the Moto X, which is one of the slimmer smartphones you can buy. The nylon version is even a tad bigger and heavier because of the thicker material, though not enough that you'd notice in everyday use. Droid Turbo vs. Moto X. However, "bulky" shouldn't be read as "uncomfortable." Despite its extra heft, the Droid Turbo isn't like lifting a dumbbell or anything. The soft nylon material along with some rubber trim makes the Turbo near impossible for me to drop. The power button and volume rocker sit on the right device, where a ridged texture makes them easy to find when you're fumbling around in the dark. Curiously, it's a little harder to change volume here than on most other phones. There's a reason for that: the volume rocker doubles as the microSIM tray. It comes right out of the phone. It's pretty neat, and one less break in the chassis, but it does make me worry that the buttons could fail after years of use. In case you're curious, the button's metal finish matches the circular Motorola logo on the back. Thankfully, that logo is one of the only ones you'll see on this phone: though Verizon has a nasty habit of turning finely crafted smartphones into walking advertisements, the word "Verizon" doesn't appear once—just that Motorola "M" on the back and the word "Droid" near the bottom. Thank you for showing restraint, Verizon. Thank you. 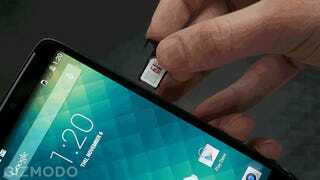 Motorola nanocoats the microUSB port and headphone jack, as well as the inside of the device, so you can confidently whip out your phone in a downpour. A few times when it began raining, I ran outside to make a few phone calls—which in any other context would make me a weirdo—but the Droid lived up to its promises. Still, don't dunk this phone in a bucket of water or carry on long chats with your BFF in the shower. The Droid Turbo is water resistant but doesn't claim any proofing abilities. The 5.2-inch screen is a comfortable middle ground between reasonable size and a hand-aching phablet monster. There were times I for the original Moto X's 4.7-inch display, but the Turbo's 2K screen made those wishes few and far between. With an AMOLED display at an unprecedented 565 pixels-per-inch, watching anything on the Turbo looks beautiful. Colors are vivid and app icons have no discernible fuzziness or bleed. Viewing angles are great and the slightly elongated bottom bezel makes it pretty comfortable to hold while streaming Last Action Hero or Big Trouble in Little China. I'm on a cheesy action flick kick, what can I say? I wish I could say that the Turbo is perfect for content consumption, but it falls short in one noticeable area for me—audio quality. Only one front-facing speaker rests on top of the device. Front-facing, good. One speaker, bad. Strangely enough, I have to reference Motorola's Moto G (a wonderful little budget smartphone) for an example of audio done right. When listening to music through smartphone speakers, dual front-facing drivers are the way to go, and it's a feature perplexingly absent on both the Turbo and the Moto X. (The Nexus 6 has them.) This doesn't mean that listening to Run the Jewels 2 through this speaker is like cleaning your ears out with a sandpaper Q-Tip, but the audio does feel somewhat tinny and lopsided. Right below that beautiful screen, Motorola tucked away dedicated capacitive keys instead of using onscreen navigation. That's not a ding: I usually want as much screen and as little device as possible on my Android handsets, but I can also understand the appeal of always knowing where to press to get back to the homescreen. Still, Android Lollipop looks mighty fine without capacitive keys on the Nexus 6, and I wonder what the Droid Turbo will be like once it receives that update—which Verizon has promised is coming soon. As its crazy powerful screen and processor would suggest, this is one of the best-looking and responsive smartphones I've used in 2014. I've used the Droid now for a week with the Moto X riding shotgun, and this thing just doesn't even hiccup. It hums right along with whatever application I'm using, even graphics-intensive games like Dead Trigger 2. Mind you, that's mostly true of the Moto X as well. With an Snapdragon 805 chip (the Moto X has the 801), it's like telling the difference between great and greatest. Both perform amazingly well. I found the Droid Turbo to be slightly more efficient at rendering 3D environments where the Moto X was a little jittery, but trust me, you'd be happy with either. However, the Turbo does have the tendency to get pretty hot during those heavy use sessions. The phone does a good job redistributing heat so it's not just one area of the phone that's absolutely scalding, but the nylon back made for sweaty palms after 10 minutes of smashing zombies. Much like the Moto X, what makes the Droid Turbo such a great phone isn't just the hardware but Motorola's sprinkle of light augmentations on top of the stock Android OS. Where many smartphone makers' skinned platforms offer services whose actual usefulness is debatable, Motorola packs in neat little apps you'll actually want to use like Moto Assist, Moto Voice, and Moto Display. Moto Display is the absolute best, especially if you work at a desk. The Turbo will gently pulse every so often to tell the time and display any new notifications. I hardly ever had to open my phone since I could see most of my notifications and emails with just one tap. This single feature is reason enough to go Motorola. No kidding. But you've also got to love Moto Assist, which makes your smartphone smarter by becoming more aware of your routine by silencing phone calls (unless repeated in case of emergency) when you're asleep and in meetings, and Moto Voice so you can issue voice commands to the phone even when it's still locked. The combination of Voice and Assist is particularly nice when driving, reading text messages and names of callers so you can keep your eyes on the road, and then letting you respond without touching the phone. One of Verizon's pre-installed apps might finally be worth your while, too: there's a Droid exclusive feature called Droid Zap which lets you easily share photos with friends or throw up pictures on a Chromecast-enabled TV. Only a Droid user can create a "Zap Zone," but anyone with an iPhone or Android device can download the Droid Zap app and join your Zone anonymously. The Zap Zone then becomes a photographic stream of consciousness. It's a cool trick, but I got bored quickly. I'd just stick with private Instagrams. Speaking of photography, the Turbo's camera is pretty decent. In normal lighting conditions, the Droid's 21 megapixels (16 megapixels when shooting in 16:9) aren't much different than the Moto X. Both pick up a great amount of detail, which we mentioned in our smartphone camera deathmatch earlier this year, and the color accuracy is also vivid and spot on. But compared to the Moto X, the Turbo shoots way better in low light. You can really see it when you look at the white brick wall in the picture below. Still, the Droid Turbo seems a little sluggish with the shutter, so getting perfect shots of fast-moving subjects could be a chore. There's also still no optical image stabilization to be found. Instead of the Moto X's "ring flash," the Turbo uses a dual LED setup that actually does a better job at capturing accurate color and skin tones. (My shots had less green tint.) As for 4K video recording, it's as great as you'd expect for a smartphone, and man, playing back your videos on this 2K screen makes it even better. Okay, the moment you've been waiting for: battery life. Verizon proudly puffs out its chest and says the Turbo can get you 48 hours on a charge, but its advertising is filled with caveats and asterisks. What's the truth? Can you actually get 48 hours? Yeah, not so much. I've been able to live through this device's full battery cycle three times now and I consistently get around 30 hours. For my first run, I used Google Maps (sans navigation), streamed some music, texted and emailed people, recorded a little audio, and snapped some photos. The phone lasted until about 1 pm the next day. The next time I purposefully used less, only picking up the device when I absolutely needed to and listened to some music on my commute. I got about the same amount of time. Now, let's be real, a day and half is great and it even last a few hours longer than the Moto X with much more power under the hood. But the Droid Turbo's battery was a lot like seeing the new Star Trek film—the trailers looked great, but it sure as hell wasn't Wrath of Khan. he Turbo just doesn't seem very power economical when the phone is idle. I grabbed the new Sony Xperia Z3, which is also lauded for exemplary battery life, and let each sit out 8 hours overnight, unplugged, without any battery-draining location reporting or always-on Bluetooth running in the background. I lost 20 percent charge on the Turbo and only 8 percent on the Z3. You could turn off Moto Display and save more power, but once you start cutting into a smartphone's core features to reach the manufacturer- quoted battery life, something is amiss. Even though I gave the battery some grief, it is very good for all the powerful hardware you're getting—just expect a guaranteed high-octane day rather than a wishy-washy two-day promise. And hey, if you do happen to need some juice, Motorola packs its $35 Turbo Charger with the Droid Turbo, which says it can power your smartphone for 8 hours on a 15-minute charge. Plugging in my Turbo at 1 percent battery, I set an alarm for 15 minutes and unplugged on the exact second. I was back up at 16 percent and was able to get about 5 hours of light to medium use. Once again, the 8 hour mark seems like a stretch, but it's a handy feature nonetheless. After a full week, I'm still a big fan of nylon. I don't know how well it'll wear, but hey, it was originally developed for the military, right? Seems pretty durable. This screen is really, really great. It has better color accuracy and sharpness compared to the Moto X and I absolutely cannot wait to see what Lollipop will look like on this thing. Maybe the Turbo's biggest boon is that it's pretty future-proof. With best-of-the-best specs, most buyers can expect for the Turbo to remain competitive with upcoming handsets at this size for at least six months, maybe even a year. If you're someone that hates buying something only for it to become obsolete a week later, you won't have to worry about that here. The Turbo doesn't seem as power efficient as could be. With Bluetooth and location reporting off, I was still burning through battery with my smartphone just sitting there. Verizon may have shown restraint with its branding, but it certainly didn't with its apps. Loading up your own company apps is one thing, but attaching lifestyle apps, like the NFL app, and making them non-removable (meaning prepare for a lot of disabling) is really frustrating and something endemic of carrier smartphones everywhere. Makes me wish I could just buy this thing through Motorola. I envy you, Mexico and Brazil. If you want a super powerful, future-proof smartphone with all the benefits that good battery life bring with it, then the Droid Turbo will serve you well. However, it's probably the most bland and utilitarian smartphone design in Motorola's arsenal (or any smartphone maker's lineup for that matter.) Moto Maker, the Moto X's online design engine that lets you personalize your smartphone, makes that device feel more personal and unique. The Turbo is just a solid color, red or black, and while the nylon is a great addition, it's not exactly the elegant finish you'll find on the iPhones, HTC Ones, and Moto Xs of the world. But that's OK. The Droid has always been all about the appeal of gritty, powerful machinery. Verizon bloat aside, it's a phone for gadget purists. If you've ever wanted a Droid, now's the perfect time to put one in your pocket.